Specifically for ScapeGoat, but should work for Surly BigFatDummy, and other chainline-impacted fat-bikes. 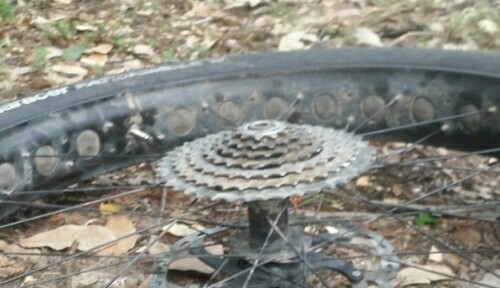 With Plus sized tires you can run any 1x gear setup you want on your ScapeGoat; but if you want to go full Fat, options are more limited: Internal gears (Rohloff), or single speed; being the easiest set ups. 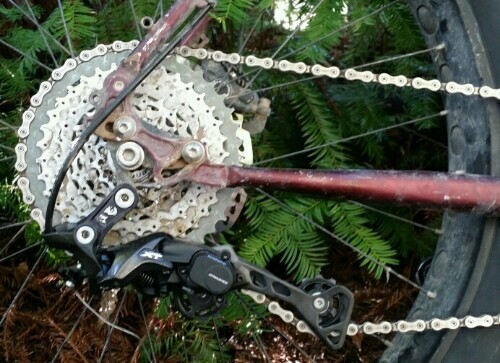 Derailleur style external gears are possible, however, but only with a custom cassette. 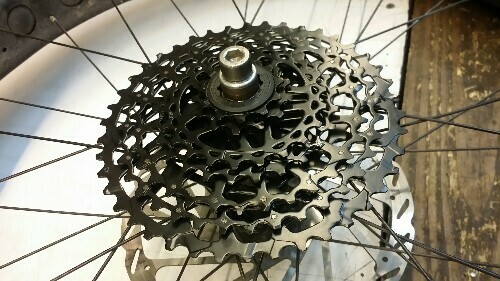 There is just enough room for 7 cogs, at 11-speed spacing (or 6 at 9-10 speed spacing, and 5 at 8-speed spacing) and I’m working on producing a wide-range short-cassette to sell; but for now, you’ll have to build your own. There’s a lot of ways to do it, a few of which I’ll cover in this how-to (all at 11-speed spacing). But let’s start with the rest of the drive train and work up to the cassette mod. To begin with, you need a really wide chain line, as wide as possible (I’ve got another article about all that) at least 58mm, but wider is better (either Surly OD cranks (using only the outer ring), @60mm CL; or a triple with a single ring in the outer position WITH 2+mm spacers between the spider and chainring, 61mm or so CL (as close as possible to the crank arm), are good options). If you want indexed gears, there is only one option; a Shimano shadowX derailleur (medium cage)with a WolfTooth ‘GoatLink 11’ (which will work with any compatible Shimano 11-speed shifter) as shown in the header(no other der I’ve tried will fit). If like me, you prefer friction shifting, any pre-11-speed derailleur will do, though if you want wide range (as I do) you will need to use a WolfTooth ‘road-link’ to clear the big granny rings. My ideal, Stubby (short wide-range) cassette goes 11, 15, 19, 24, 30, 36, 42, and I’ve put more than a thousand loaded mountain/desert miles on just such a cassette. The wide gear range is important to me, and the wider-than-industry-standard steps between gears actually suit my riding style, but sourcing, and deconstructing the parts to build one is a little involved; so I’ll start with other, more straightforward options first. *The first and 2nd position cogs on all (Shimano type) cassettes are specially shaped – the 1st position having a built in xtra-long spacer, which fits into a recess in the 2nd position cog. If you get rid of the 13t cog, with the special recess, the spacing between the 1st and 2nd gears will be wrong (and impossible to index) but not functionally problematic with friction shifting. You could also modify the 1st position cog, or source a 15t 2nd position cog – but both of those options are more advanced/costly. option 3: This is the cassette I’m riding currently, and has the same steps and range as the one I’m trying to produce. (sorry no pics, yet, I’ll take some next time l make one) It starts with a Microshift CS-H110 11-42 cassette. These are harder to take apart: you have to grind/drill off the heads of the rivets that hold the cassette together. And then carefully disassemble it. Then grind/drill the rivets holding the 32t cog to the 36t and 42t cogs. 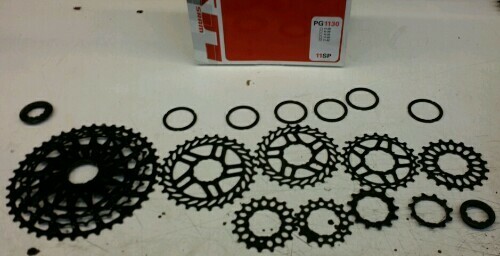 Now you have to source a 30t cog – I got mine from a SRAM 10-speed cassette l had around, but you can also order them from (clemenzo.com). The last decision to make is what to do about the 1st/2nd position cog problem. I opted to grind the extra length off the 1st position cog, but a better solution would be to source a 15t 2nd position cog (also available from clemenzo). Now all you have to do is put it back together 42, 36, 30 (from somewhere else) 24, 19, 15 (ideally special 2nd position) 11 (maybe modify). In all cases the gears want to sit *as far* outboard on the freehub body as possible, so add spacers behind the cassette (l have ~5mm of spacers behind my cassette on my Hope short freehub body) until you can just barely get the lock ring to engage. Good luck, and let me know if you come up with a better way or source of cogs. I am running 42t cogs on 8 speed drivetrains with Shimano 7/8 speed thumb shifters. Generally ride in friction but it does index with the XT M780 RD. The cog progression is 11-13-16-19-23-28-34-42. I have also gone 7 speed, 11-13-16-20-26-34-42 or 12-15-18-23-28-34-42.